I suspect our readers have made New Year Resolutions about increased physical activity, weight reduction and are perhaps even partaking in Dry January. But there is no chance of fulfilling any resolutions if you go to Chip Shop this month. This new restaurant opened in the first week of November and is already pulling in the punters. It was opened by the people who own The Brixton Village Grill in Brixton Village. They sell…. wait for it … fish and chips but this is not the usual takeaway (although you can take it away if you want to). 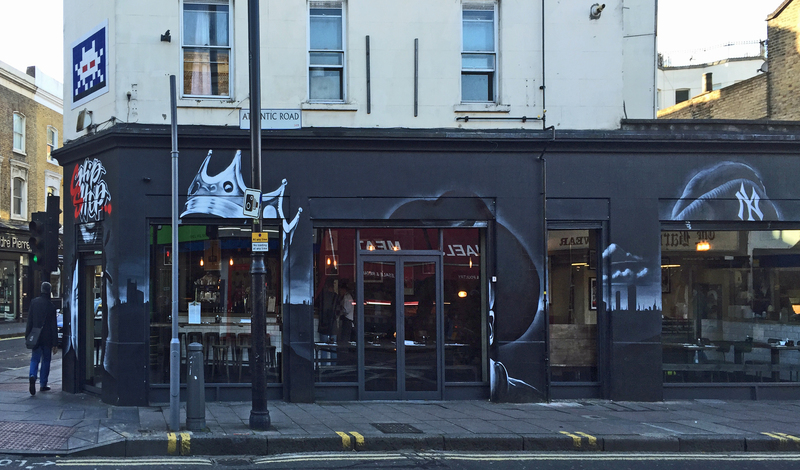 It labels itself as a hip hop chip shop and we can vouch for the steady stream of music which definitely does not stay in the background. Small and perfectly formed tables of two, three or four allow for reasonable conversation. 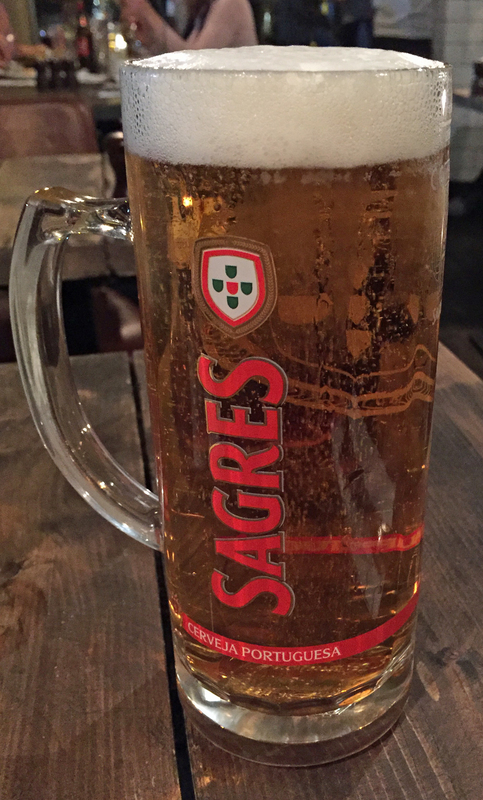 The menu has the usual cod and haddock but then it also has sea bass, monkfish, lobster and specials like swordfish. 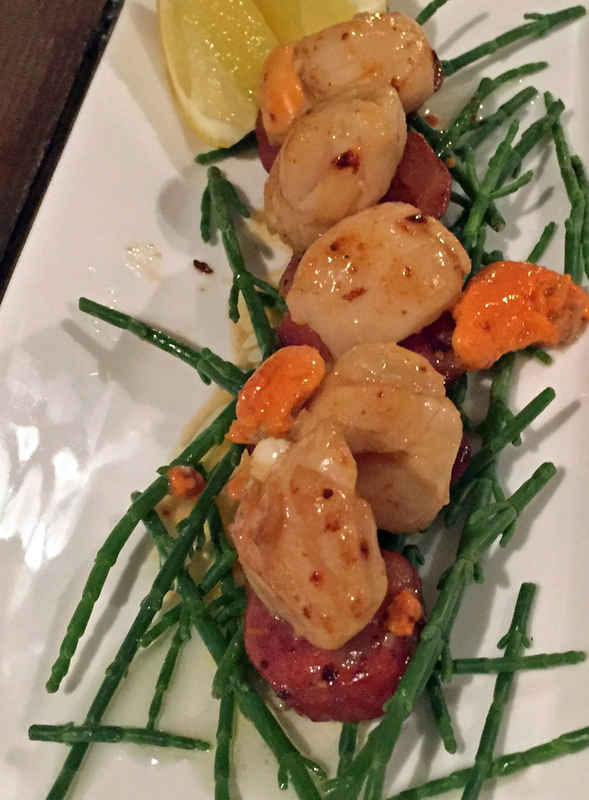 We chose a starter between the two of us – scallops with chorizo on a bed of samphire, which was easily enough for two.The scallops were cooked as they should be and the samphire wasn’t woody but still had a good crunch. 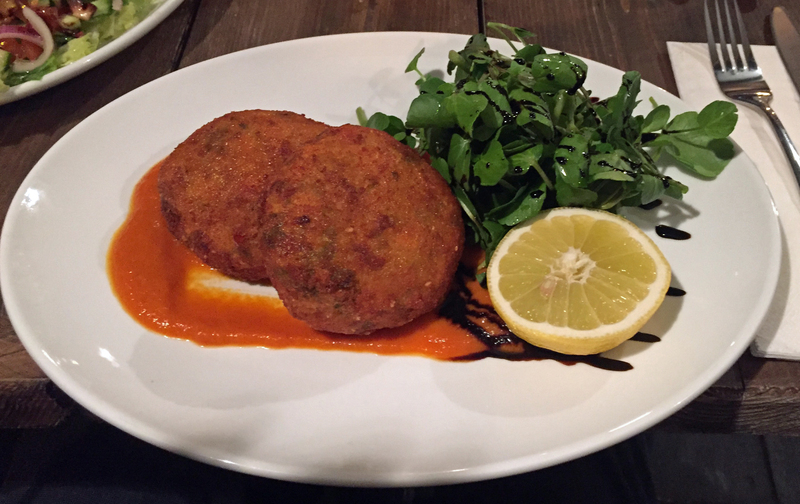 To follow we had a special – swordfish – and the fishcake. Most of the mains, although not the fishcake, come with two of the following: rice, chips and salad. We watched the monkfish and chorizo for other diners come by on skewers hung upside down and a really large lobster but our meal proved to be more than a match for the “show”. 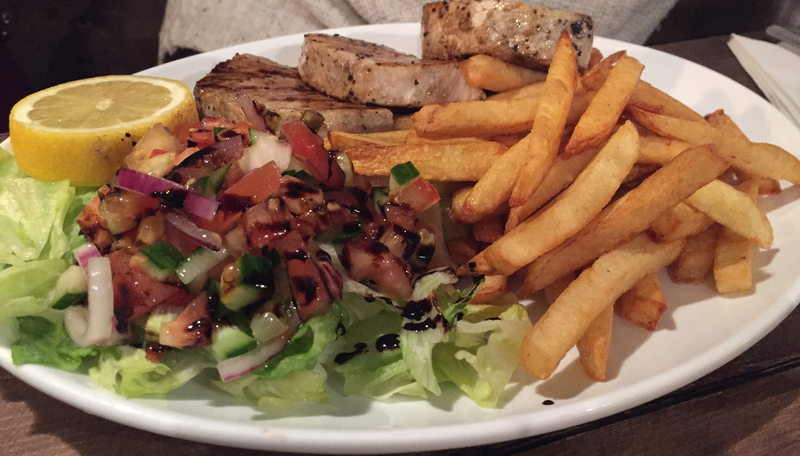 The swordfish, which is a meaty fish anyway, was also enough for two, especially with the salad and chips plus some beans we had ordered as a side. The salmon and haddock fishcake was of the same size and it doesn’t come with chips, although it really needs an accompaniment to make it interesting. Perhaps it would be better as a lunch dish and, anyway, it now seems to have disappeared from the menu..
We fitted in a shared dessert of pannetone bread and butter pudding. This was not up to the standard of the other parts of the meal as it was a hefty slab – no lightness that you would have expected from the pannetone. Clearly it was chilled and then heated and perhaps they need to consider another option. If you ate this for lunch you would be asleep all afternoon. The cheesecake or the sticky toffee pudding might have been better choices. We washed it all down with tap water and a Sangres beer. The total bill for two was £42.65, before adding a tip and we thought this was value for money. We had really good food, the service was attentive and we came out really full. We ate at 8.00pm but by 9.00pm it was very full, so choose your time carefully. We will be back, with the £20 whole grilled lobster a likely target.